ABC News is reporting that Mark Warner is leaning toward a run for the VA Senate seat being vacated by Republican Senator John Warner. 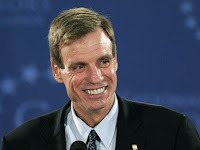 The Bottom Line: Since Mark Warner's Senate bid may take him off the VP short list in 2008, it's time to add him to your short list on Intrade. As of this afternoon, the Mark Warner VP contract was trading at 14.8.